Published on Apr 24, 2014 | It’s easy to propagate many native plants. John Dromgoole from The Natural Gardener gives us the basics to multiply your favorite drought-tough plants. Published on Apr 11, 2014 | Join Kim Eierman of EcoBeneficial! for an interview with Annie White about her research on the attractiveness of native plant cultivars versus straight species native plants. Annie is a Ph.D student at the University of Vermont in the Department of Plant and Soil Science. Published Jan 1, 2014 | This is video #1 in the “Protecting What You Love” video series produced by Tip of the Mitt Watershed Council. This video focuses on the benefits of bioengineering techniques to create natural shorelines verses hard armoring (seawalls). 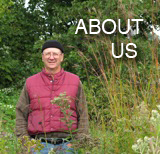 This is video #2 in the “Protecting What You Love” video series produced by Tip of the Mitt Watershed Council. This video focuses on the benefits of greenbelts and the use of native plants in your waterfront landscaping to protect our lakes, rivers, and streams. This is video #3 in the “Protecting What You Love” video series produced by Tip of the Mitt Watershed Council. This video focuses on the benefits of using native plants in your waterfront landscaping. For more information, visit watershedcouncil.org. Habitat: The place or environment where a plant or animal naturally or normally lives and grows; providing sustenance, shelter, and facilitating reproduction. No animal lives in a mowed turf environment. Some fungi can prey upon lawns, but no animal or bird can live there; and the insect life in the soil below is lesser in diversity and environmental value than what lived there before lawn was imposed upon it. There are grassland birds, woodland birds, seaside birds, wetland birds, and birds whose habitat is referred to as forest edge, but none can survive on a lawn. Birds, butterflies, pollinators, amphibians, mammals—you name it—struggle to locate habitats that are ever-increasingly fragmented by ever-expanding acres of lawn and competition from invasive species. We can enjoy the advantages of farmlands, managed forests, highways and parking lots, houses and structures of commerce, but most mowed turf serves no purpose for recreation or any other rational use. If you ever wondered how you could apply the counsel “Think Globally, Act Locally,” this is your answer: Put back the plant species that took 10,000 years to evolve into the ecosystem over which you have control for an instant in time. Landscape with native plants. Published on Oct 28, 2013 | Dr. Dwayne Elmore, Associate Professor of Wildlife Ecology, joins Kim Toscano, host of Oklahoma Gardening, to survey the recent prairie restoration.